Scoop the Carnation Caramel into a small saucepan and mix till smooth. Add the Carnation Light Evaporated Milk a little at a time whilst stirring till all incorporated and smooth. Slowly heat until just at the boil. Remove immediately and pour into a small serving bowl. 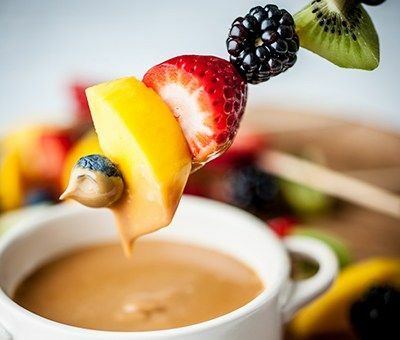 Cut the fruit into bite size pieces and arrange on skewers, serve alongside the caramel fondue.